After a 10-3 regular season, Temple football head coach Matt Rhule has re-upped with the university. He has a deal to lead the Owls until 2021. By Dan McQuade·	 12/7/2015, 12:43 p.m. The coach who led Temple football to the best season in it history is staying put. 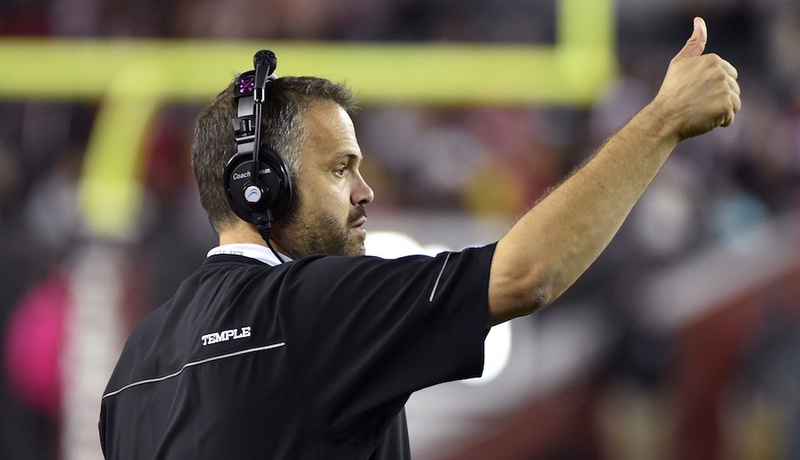 For a long time, actually: Today Temple announced Matt Rhule has signed a six-year deal that keeps him as the Owls’ coach until the 2021 season. The school said it will not disclose financial terms, but it’s presumably a nice raise for Rhule. Rhule, a linebacker at Penn State from 1994 to 1997, entered coaching after his playing career ended. He was a defensive position coach at Albright, Buffalo, UCLA and Western Carolina (where he later became defensive coordinator) before coming to Temple in 2006. He was a position and assistant coach for the Owls, then left to coach the New York Giants’ offensive line in 2012. As it so happens, the Giants upset the Patriots in the Super Bowl that season. Rhule not only won Rose and Fiesta bowls as a player for the Nittany Lions, but he has a Super Bowl ring as well. After that, he was named Temple’s head coach in 2013 after Steve Addazio left for Boston College. After a 2-10 first year and a 6-6 season in 2014 — the Owls didn’t go to a bowl despite being eligible — the Owls had a breakthrough season in 2015. They beat Penn State. Their game against Notre Dame, a narrow 24-20 loss to the Fighting Irish, included a College GameDay broadcast from Independence Hall. The Owls won the American Athletic Conference East division title and will play Toledo in the Boca Raton Bowl. The 10 regular season wins are the most in program history, and the Owls go for their first 11-win season on December 22nd. Rhule was reportedly a top choice for the head coaching vacancy at Missouri, but he apparently turned them down. A new deal doesn’t mean Rhule will definitely be in Philadelphia until 2021 — contracts can be bought out, and there may be programs bigger than Missouri calling in the future if Rhule keeps winning at Temple — but it certainly increases the chances he’ll be here for the long haul.